Florida goalie Roberto Luongo won for the second straight time in his return to the lineup to lead the Panthers past the Edmonton Oilers 4-1 on Thursday in Sunrise, Fla.
Luongo, who missed nine games, stopped 26 shots in his first home start. He returned last Friday from a leg injury to lead the Panthers past Winnipeg 4-2 to conclude the teams’ NHL Global Series in Finland. Evgenii Dadonov, Nick Bjugstad, Jonathan Huberdeau and Colton Sceviour scored for the Panthers, who won their first game on home ice. 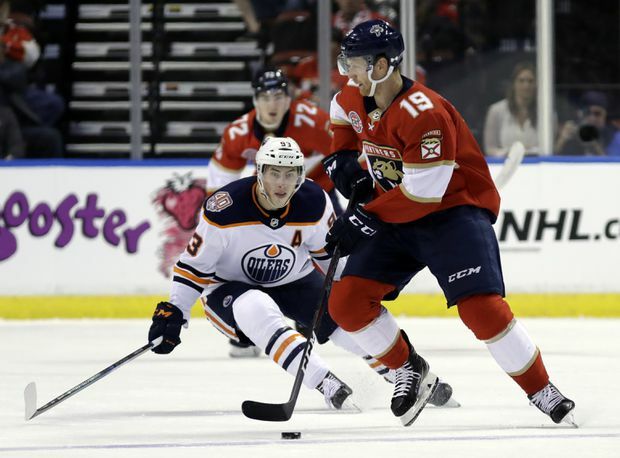 Florida Panthers defenseman Mike Matheson (19) skates with the puck as Edmonton Oilers center Ryan Nugent-Hopkins defends during the second period of an NHL hockey game, on Nov. 8, 2018, in Sunrise, Fla. Right winger Mike Hoffman assisted on the goals by Dadonov and Sceviour. Hoffman has points in each of Florida’s last 10 games while Dadonov stretched his streak to nine -- the two longest in the NHL. It was the Panthers’ first home win over the Oilers since a 5-4 victory on March 8, 2002. Leon Draisaitl scored for Edmonton, and Connor McDavid, the league’s second-leading scorer, had the lone assist to move him to within one point of Colorado’s Mikko Rantanen. Cam Talbot made 29 saves. Edmonton finished 1-3-0 on its 4-game road trip and lost its third straight game for the first time this season. Luongo kept Edmonton off the board early with a pair of outstanding saves in the first five minutes. He robbed Draisaitl with a point-blank glove from the bottom of the right circle, and then three minutes he sprawled across the crease to deny Ty Rattie, who prematurely raised his stick in a goal celebration. Florida grabbed a 1-0 lead on a spectacular 3-on-2 goal from Dadonov at 6:45 when Hoffman toe-dragged a feed to Aleksander Barkov, who slid a backhanded pass from the slot to a streaking Dadonov. The Russian winger deked Talbot and slammed home his team-best seventh goal, and an unimpeded Bjugstad scored his third marker when he flipped in a rebound from the low slot at 8:12 for a 2-0 lead as the Panthers outshot Edmonton 19-4 in the period. Draisaitl scored his 10th goal on an assist from McDavid on third period’s first shift to cut the deficit to 2-1, but Huberdeau regained the two-goal lead when he snapped home his third tally on a power play at 3:43. Sceviour added an empty-netter in the final minute.